Lawmakers have decided to suspend the debt ceiling again -- this time, at a level that's now about $512 billion higher than it was last fall. On Tuesday, the Treasury Department reported that the nation's borrowing limit automatically reset to roughly $17.2 trillion, after the last suspension expired on Friday. 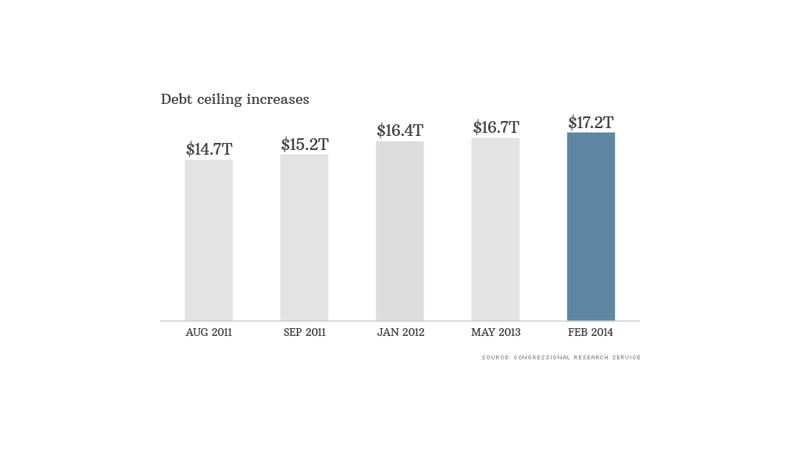 Here's why: Suspensions have become lawmakers' favorite way of "raising" the debt ceiling. They let Treasury borrow as needed to pay the bills and avert default. And when the suspension ends, the debt limit resets to the old cap plus whatever Treasury borrowed during the suspension period. In other words, a suspension doesn't technically raise the debt ceiling, but that's the net effect. The beauty for Congress is that lawmakers don't have to go on record as voting for a formal increase by a specific dollar amount. The reset to $17,211,558,177,668.77 marks the fifth effective increase in the debt ceiling since August 1, 2011, when it was $14.3 trillion. The debt ceiling suspension approved this week by both the House and Senate will last through March 15, 2015. The Bipartisan Policy Center estimates that between now and then Treasury will have to borrow roughly $1 trillion. Treasury last week announced that it had begun to use special accounting maneuvers to make sure the country doesn't breach the limit, something it was forced to do because at the time Congress had yet to raise or extend the borrowing limit as needed. But House Republicans on Tuesday said they would drop their demands for concessions tied to a debt limit extension. So House Speaker John Boehner brought a "clean" debt ceiling bill to the floor for a vote, and it passed Tuesday evening with just 28 Republicans backing the measure. It then moved to the Senate, where it passed, but only after the Senate broke a filibuster led by Sen. Ted Cruz. The vote came just in time. Congress will be on recess until February 25 and Treasury Secretary Jack Lew had warned that lawmakers had to raise the debt ceiling no later than February 27. Budget experts say the debt ceiling is a flawed concept since the decision to raise it is almost always divorced from the decision to pass spending and tax policies that obligate Treasury to borrow more in the future.